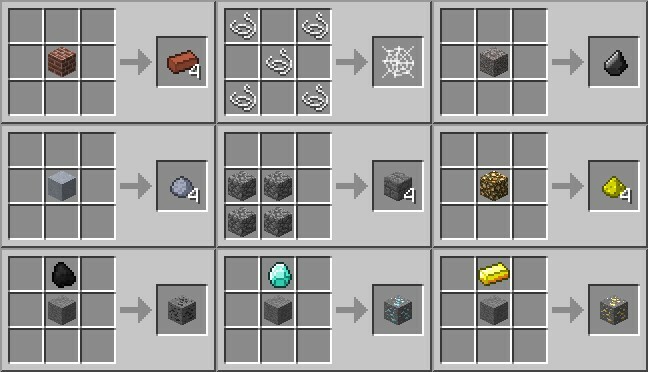 Do you ever want grass, mycelium, diamond ore, coal ore, iron ore, gold ore, redstone ore, lapis lazuli ore, snow, ice, cobweb, mossy cobblestone, cracked stone brick, mossy stone brick, nether brick, for buildings but you don't like to use inventory edit or it's very hard to get them? Here is the solution! 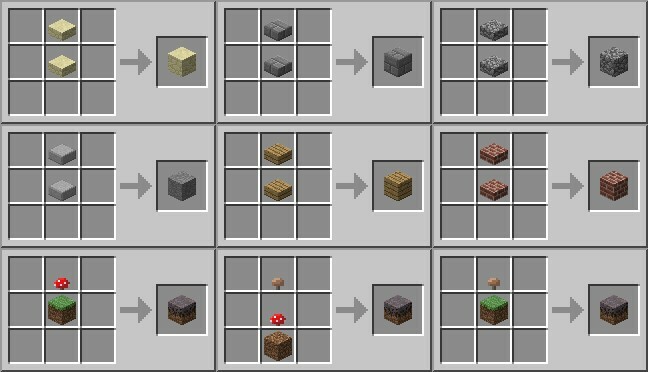 With this mod you can craft every single block. You can see the full list of recipes in the images. You can download the files, and after download just follow the installation instructions. You need Risugami's ModLoader to use this mod. Sticks [Get 3 from a fence]. Can you use this in 1.2.5 ??? 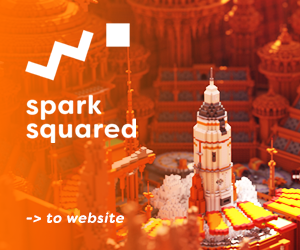 I would like to post your mod at Minecraft forums. I wouldn't take the credit for making this mod. "Here is the solution! 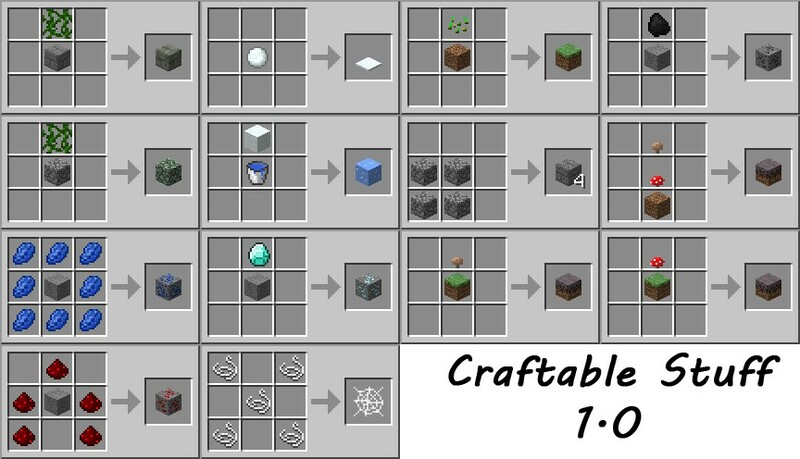 With this mod you can craft every single block." also it says 100% but it should be 75%. 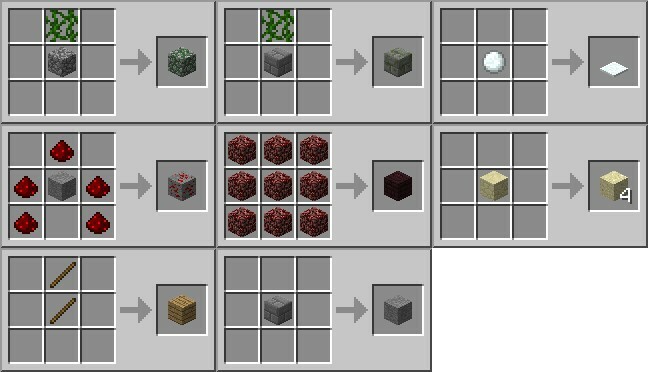 can you make a way to make a cracked stone bricks like this in stead of using cobblestone. Crafting will take 1 use away from the pickaxe. I really think that it's a waste of pickaxes. 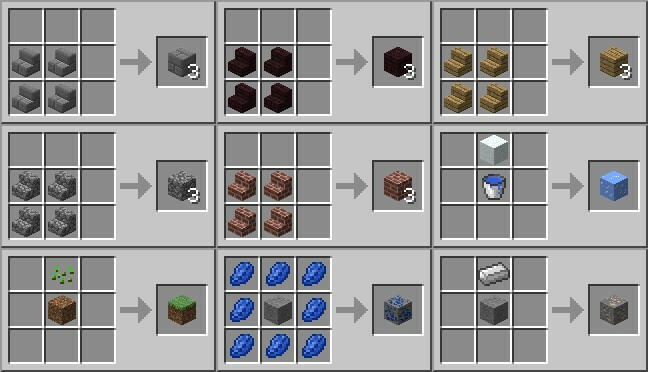 Why you don't get some cobblestone with the pickaxe instead? I think its a better way to craft it only it takes 1 use away from the pick. OK and can you make it 1.2.4? I'll do that in a few days, I'm a litlle busy these days.. If you don't like the mod, just don't comment... And if you think you can do better, do it. Because it's easier to talk than to do, right? Very sensible mod, thanks for making.